Sunday’s R@SKLs ride was one of our standard routes. From D’Bayu in Bukit Jelutong to Rawang via the Guthrie Corridor Expressway (GCE) and the Kuala Lumpur – Kuala Selangor Expressway (LATAR). 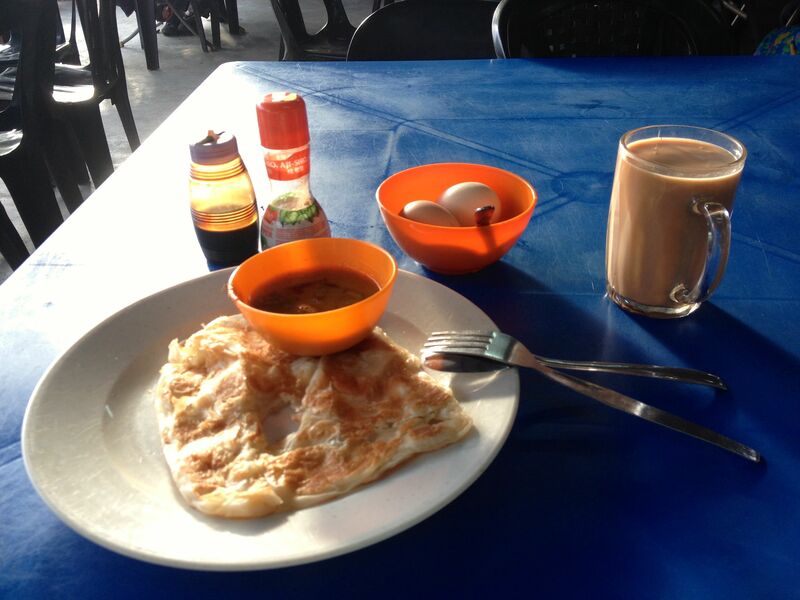 Breakfast in Rawang, and then back to Bukit Jelutong. We had a wet start to the ride. By the time we got to Denai Alam, 8km / 5mi away, it was bone dry. Hooray. As we approached Rawang on LATAR, we could see the elevated section of the Rawang Bypass in front of us. The Rawang Bypass, when open, will divert traffic travelling on Federal Route 1, between Kuala Lumpur and Serendah, away from Rawang. This will ease congestion on Jalan Rawang. It is a much-delayed project, construction having started in early 2009. Friends have posted photographs of their recent rides on the bypass. The roadway is complete, and just the finishing touches remain before the bypass is finally opened to traffic. And therefore closed to bicycles. Over breakfast we debated riding the length of the bypass. None of us had ridden it before. We were all up for an adventure. Getting to the bypass required crossing two lanes of Jalan Rawang. Fortunately Jalan Rawang is not very busy on Sunday mornings. The direction we came from meant that we had to ride up the wrong side of the roadway. The construction crew didn’t bat an eye as we rode under the barrier and onto the bypass. The high point of the elevated section of the bypass is 65 meters / 213 feet above the ground. It has to the clear the exit ramp, which is itself elevated, which connects LATAR to the KL-bound lanes of Jalan Rawang. 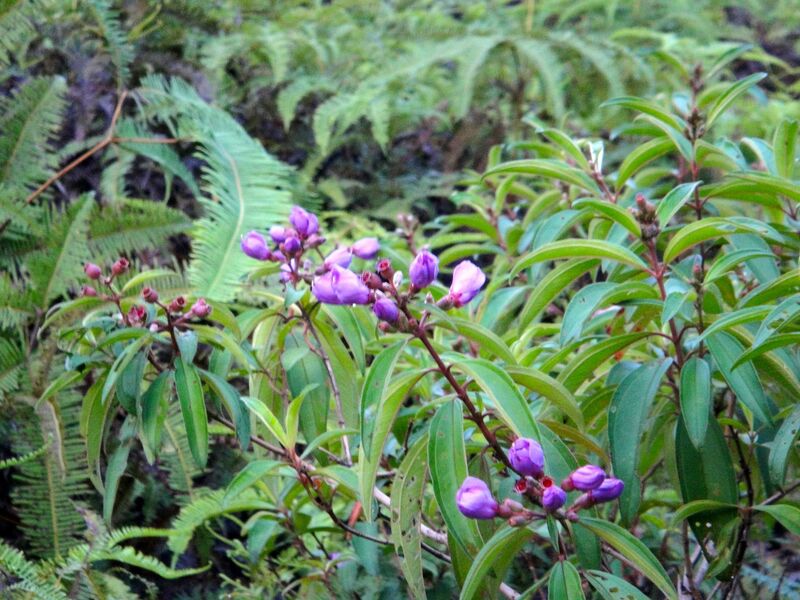 and it has to pass over the Kancing forest reserve, minimizing disturbance to the green area below. And upwards. For about 4km / 2.5mi. The views are very nice, and the gradient is challenging but not excessive. We were happy to get to the highest point of the elevated section. We had the road all to ourselves, so . . . It turned out well to be on the wrong side of the road at first, because there were a lot of workmen and equipment on the other side of the road. Just after the elevated section the road was closed off. There were workmen paving the lanes in front of us. Fortunately there was a break in the concrete central divider, so we could cross onto the correct side of the road. 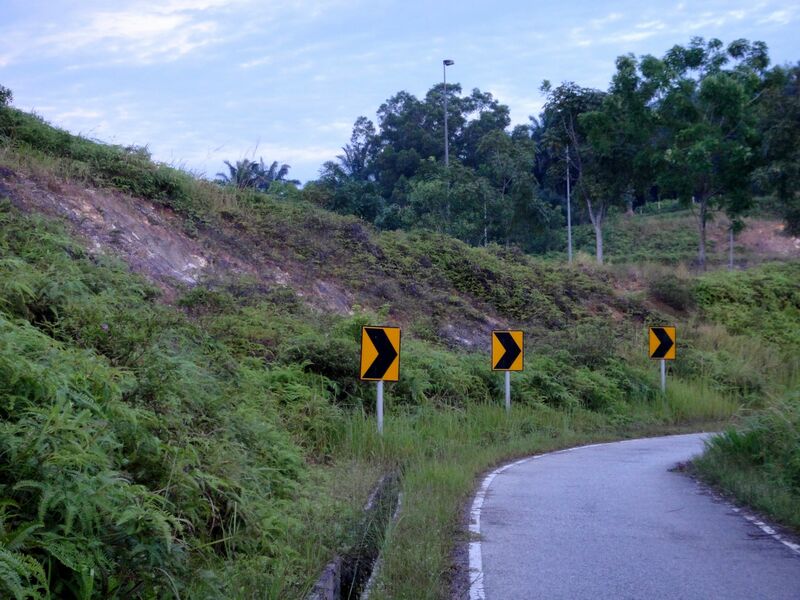 There was another short climb, and then a high-speed descent to the end of the bypass at Sungai Choh. Everyone made it back to Federal Route 1 without incident, except for one puncture. It was worth being adventurous. 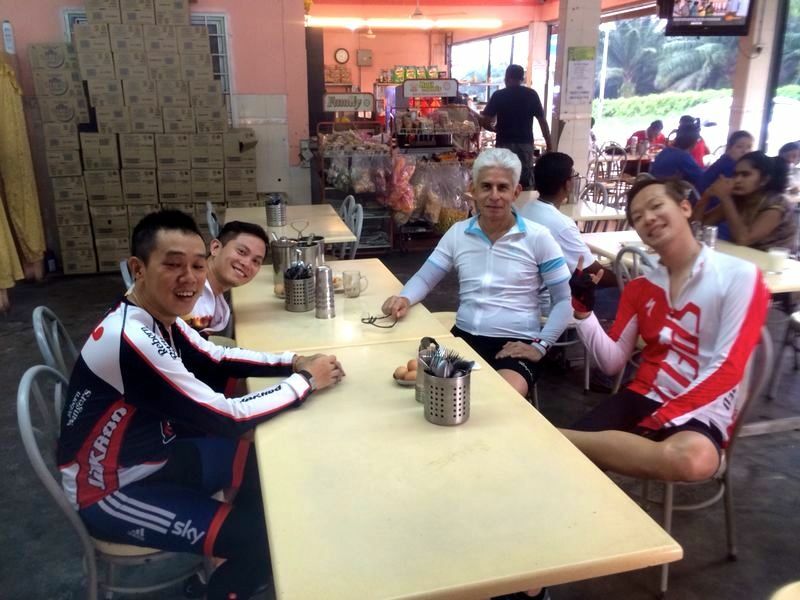 We all enjoyed riding the Rawang Bypass. I propose that the R@SKLs, in the words of Steely Dan . . .
Posted in Cycling in Malaysia and tagged Bukit Jelutong, D'Bayu, Denai Alam, Guthrie Corridor Expressway, LATAR Expressway, Rawang Bypass. Bookmark the permalink. Marco, Mark and I attempted a ride to the KTM Komuter station at Tanjung Malim. We started from Mark’s house in Taman Mayang Jaya. We followed our usual route toward Rawang via the Guthrie Corridor Expressway. Our plan had been to get onto the LATAR Expressway and ride into Rawang from the south east. But as we circled around the cloverleaf intersection to get onto the LATAR Expressway, we noticed very dark clouds and rain over Rawang in the distance. So we looped around the cloverleaf again and got onto LATAR going in the opposite direction, toward Kampung Baru Kundang. The skies were clear in that direction. 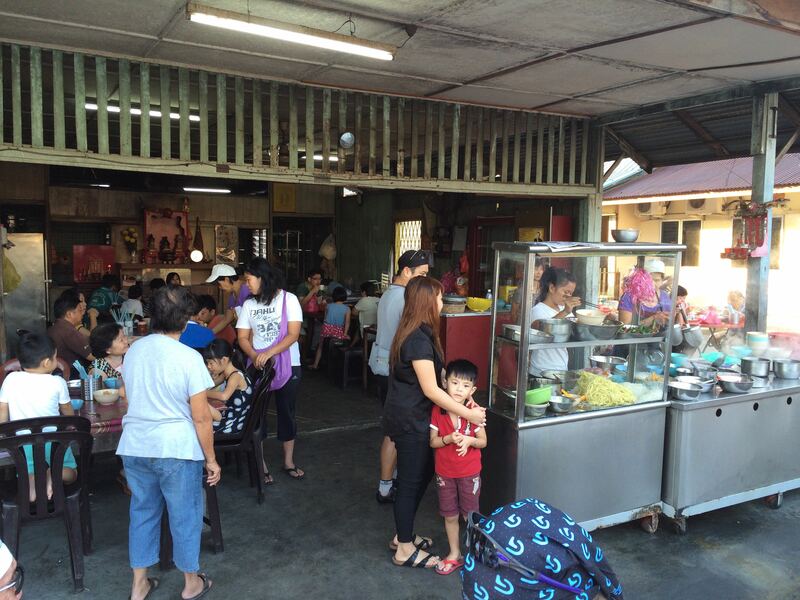 Our new plan was to stop at our favourite noodle shop in Kundang, and weather permitting, get to Rawang from the south west. It was spotting with rain when we had finished our noodles. We took a chance and rode toward Rawang anyway. The drizzle soon stopped, but it had already rained quite hard, and the roads were very wet. Why do I always have a white jersey on when we hit wet roads? 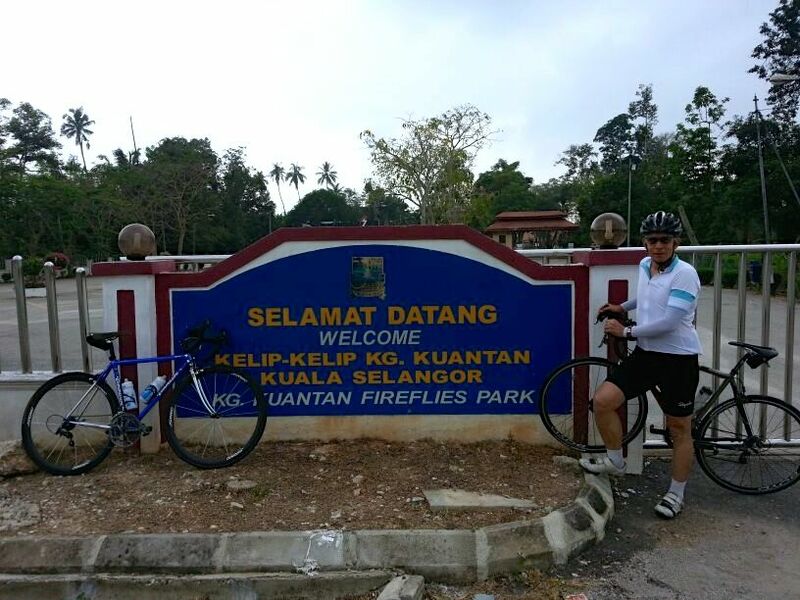 We rode through Rawang and onto Federal Route 1. Federal Route 1 is the oldest federal road in Malaysia, as is one of the nation’s earliest public roadways ever constructed. It runs the length of the Malay peninsula, from the causeway into Singapore up to the Thai border in the north. As we left Rawang toward Serendah the road dried up. We had pleasant, overcast riding conditions. The skies were gloomy, but we thought we had dodged the rain. Not so. The rain caught up with us while we were stopped at the Petron station in Rasa. We waited at the petrol station for about fifteen minutes in the hope that the rain would stop. It did not. So we rode out into the rain. By then the conditions were miserable. Federal Route 1 is a busy road. We were riding through rain and the spray thrown up by passing vehicles. We decided to stop at the nearest KTM station, which was 8km / 5mi away in Kuala Kubu Bharu. Tanjung Malim was a further 20km / 12.5mi away. Too far given the very wet conditions. We bought a ticket for our bikes, and tickets for ourselves, and sat at the station with a drink in our hands, waiting for the train. The towns along the KTM Komuter line to the north of Kuala Lumpur are smaller than the towns to the south of the city. Which may explain why there are less people on the trains going south from Kuala Kubu Bharu than there are on the trains going north from Seremban. We shared the carriage with only two or three others all the way to our stop at Sungai Buloh. We hopped off the train at Sungai Buloh, which was the closest station to Taman Mayang Jaya. By then the rain had stopped, and the sun was out. We had to negotiate some busy roads for the first few kilometers, but once we were in Kota Damansara the traffic was less fraught. It was lunchtime when we got to Aman Suria, which is the neighbourhood adjoining Taman Mayang Jaya. Patty & Pie is in Aman Suria. Their burger lunch special hit the spot. Another overall enjoyable ride (bike) and ride (train), despite the rain. Posted in Cycling in Malaysia and tagged Guthrie Corridor Expressway, Kampung Baru Kundang, KTM Komuter, Kuala Kubu Bharu, LATAR Expressway, Patty & Pie, Rasa, Rawang, Tanjung Malim. Bookmark the permalink. 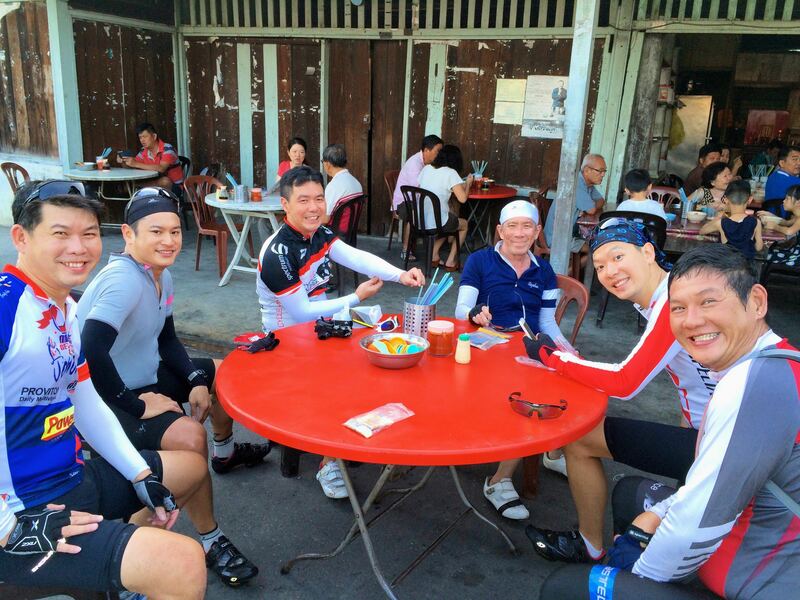 Seven of us turned up at D’Bayu for a mystery ride. Marco had a surprise route for us. The first 25 kms was the standard run to the Kundang exit on the LATAR Expressway. 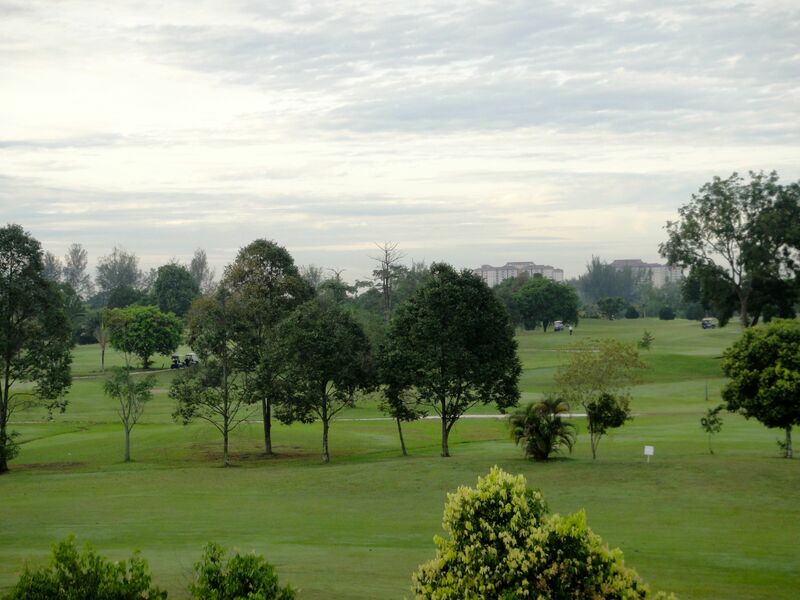 This time, instead of turning left toward the Kundang Lakes Country Club, we turned right toward Kampung Baru Kundang. Uppermost on everyone’s mind was to find a place to eat. We assumed that there would be some restaurants in the village. We didn’t expect to find a really good one. 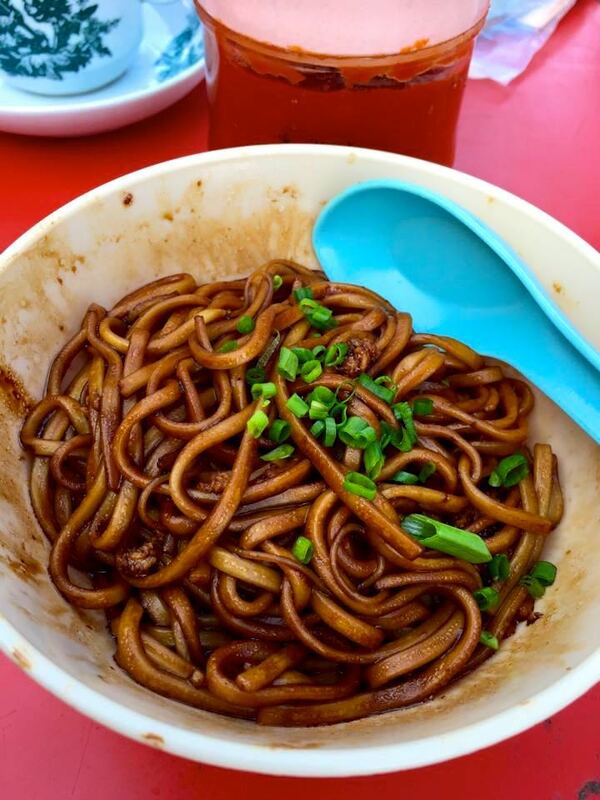 Sin Loong Kee Noodles is tucked away off Jalan Pekan 1, hidden behind all the cars parked in front of it. We quickly realised that Sin Loong Kee must be a special place. Almost all the tables inside the restaurant, and outside in the car park, were full. People were also queuing up to buy noodles to take away. 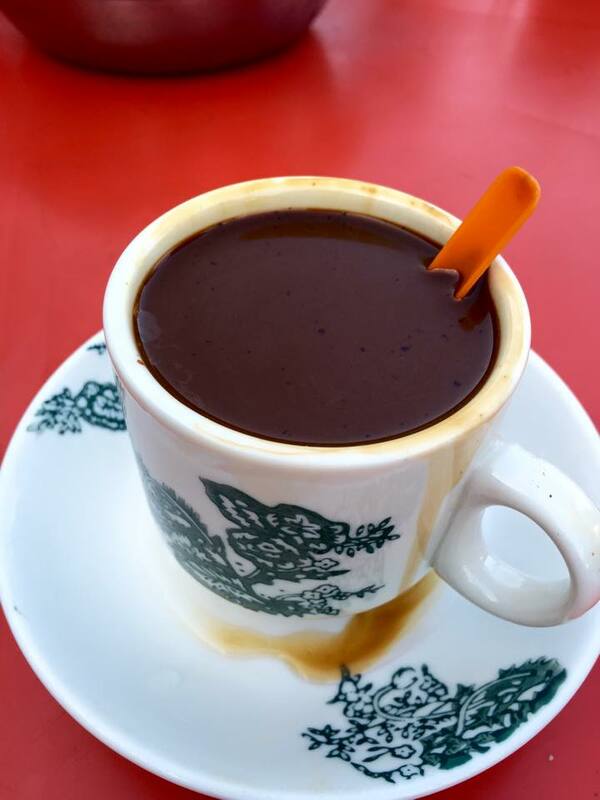 Some research tells me that the 60-year-old Sin Loong Kee shop has been run by Chin Yoke Wai, 34 and his family for three generations since his grandfather opened the restaurant. To our initial dismay, the pile of noodles in the glass case quickly disappeared as the takeaway orders were filled. To our relief, replenishments regularly came out of the back of the shop. We sat at the last empty outdoor table and waited expectantly for our orders to be taken. The family that runs this restaurant would not be rushed out of their routine. When it was our turn to be attended to, one person took our drinks order, and another our food order. This was home style cooking at its best. The noodles were made on the premises. 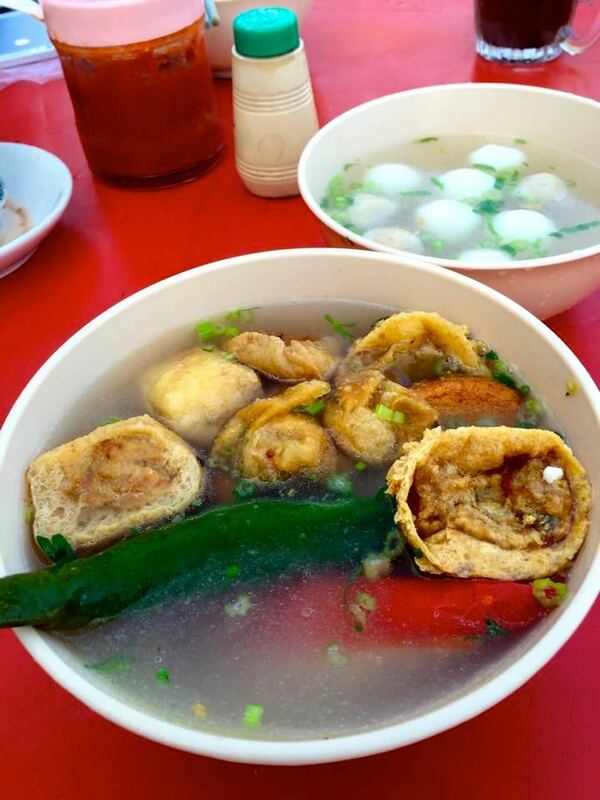 As were the yong tau foo and the fishballs to accompany the noodles. The coffee was good too. Comparable to the coffee at Pun Chun. No time for small talk! We will be visiting Sin Loong Kee again. We didn’t just eat. We did more riding too. 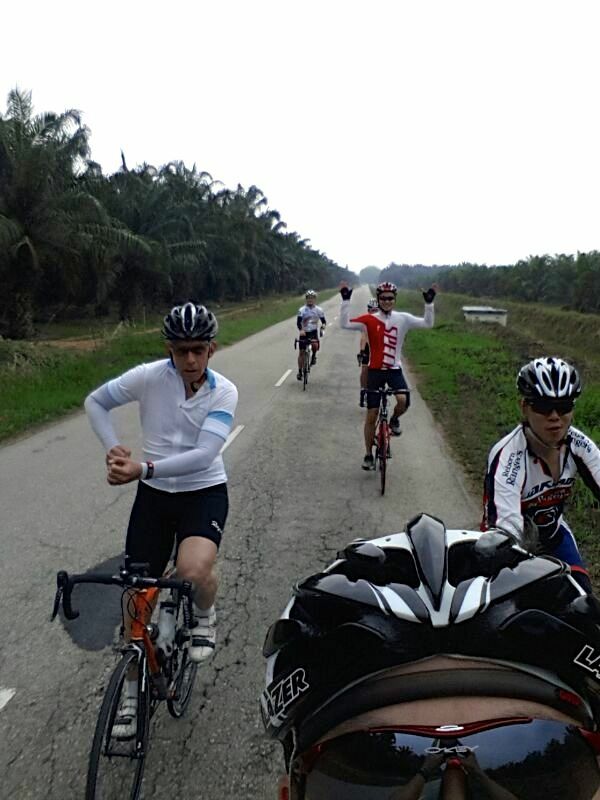 We cycled toward Batu Arang, through the Selangor Fruits Valley area, and on towards Batang Berjuntai. Then we headed south to Ijok and the LATAR Expressway back to Bukit Jelutong. I had a flat tire on the road near Batu Arang. Cedric has never changed an inner tube before, so this was the chance for a lesson. Since there was an audience, of course things went wrong. While putting the rear wheel back in the dropouts I managed to jam the chain between the small cog and the derailleur. The only way to free the wheel was to remove the quick release skewer. Not the best demonstration for Cedric. It was a good thing there was a shady spot by the side of the road. It was a hot day. It certainly did feel like 38° C / 100° F at noon. We had to stop at a few petrol stations and R & Rs to rehydrate and cool down. But it was a good ride, despite the heat. We hadn’t planned on such a long one though. About 110kms in all. Surprise! 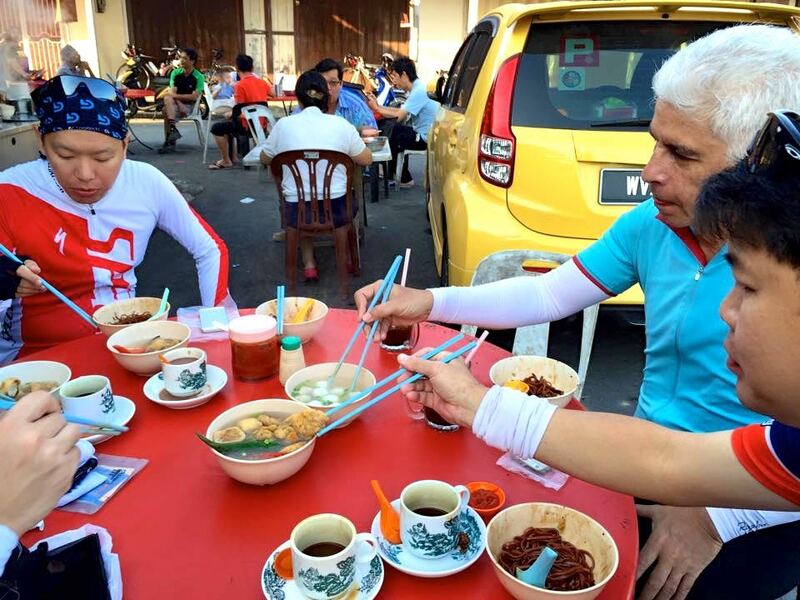 Posted in Cycling in Malaysia and tagged Batang Berjuntai, Batu Arang, Ijok, Kampung Baru Kundang, LATAR Expressway, Selangor Fruits Valley, Sin Loong Kee Noodles. Bookmark the permalink. I have a full-time job now. It is lots of fun, but it does cut into my cycling time. I can’t get to all the weekday evening rides. My job also cuts into my bike-fitting time. Sometimes I have to forgo a Saturday morning ride to do a bike fit. So it was very nice to meet up with the Flipsiders yesterday morning at Bukit Jelutong. Mark had planned an extension to our usual Kundang route. Perhaps an additional 20 or 30 kilometers on top of the usual 60 km. The first stop, as usual, was for food and drink. After teh tarik and roti canai or nasi lemak, we continued along Jalan Kuala Selangor past the Sungai Buloh Prison and onward to Ijok. On the other side of Ijok we turned right onto one of the longest arrow-straight roads I have ever been on. 8 kilometers in all. This is a rarely-used road, so we took the chance to lark around. Our next stop was for photographs at a popular tourist spot. The location of what is reputed to be one of the biggest firefly colonies on the world. 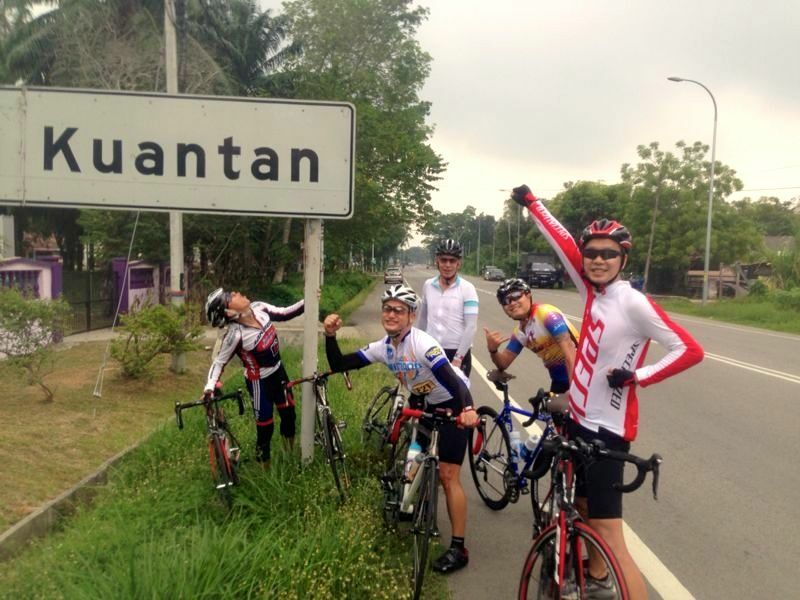 We didn’t ride quite as far as Kuantan. It was fun pretending minus Danny who was behind the camera. The anti-clockwise loop from Ijok brought us back to the LATAR Expressway. From there we were on familiar roads. That is until we got to the interchange with the Guthrie Corridor Expressway. The LATAR Expressway is 32 km long, and it runs between Ijok and Templer’s Park. 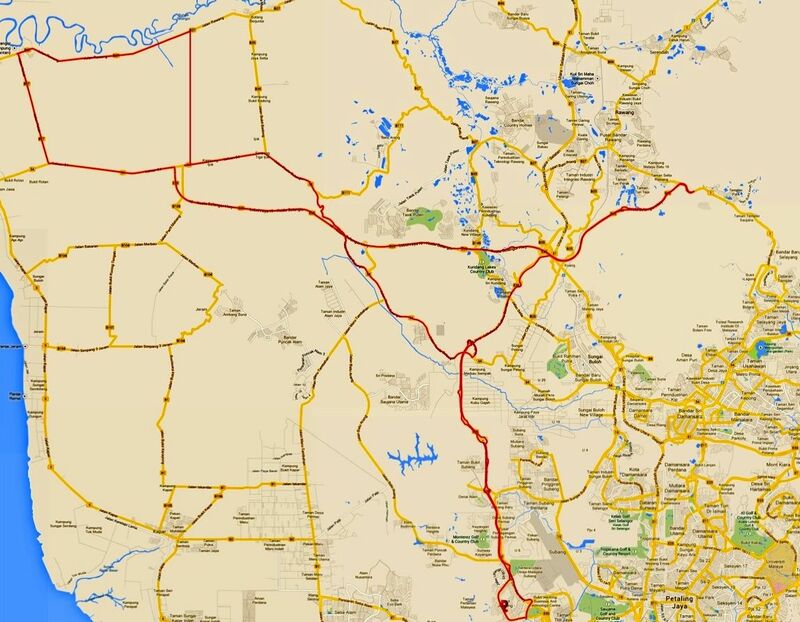 We have ridden the 21 km from the Guthrie Corridor Expressway interchange to Ijok and back many times. We had never done the 11 km from that interchange to the other end of the LATAR at Templer’s Park. By that point in the ride we were on track to cover about 110 km. Marco and I couldn’t convince Cedric, Chris, Danny and Mark to ride an extra 22 km. They headed back to Bukit Jelutong, and Marco and I rode toward Templer’s Park. There wasn’t a u-turn at the Templer’s Park end of the Expressway like there is at the Ijok end. So we had to get across four lanes of traffic to head back to the Guthrie interchange. Fortunately there were roadworks in progress, so traffic was forced to slow down enough for us to turn around without getting run over. 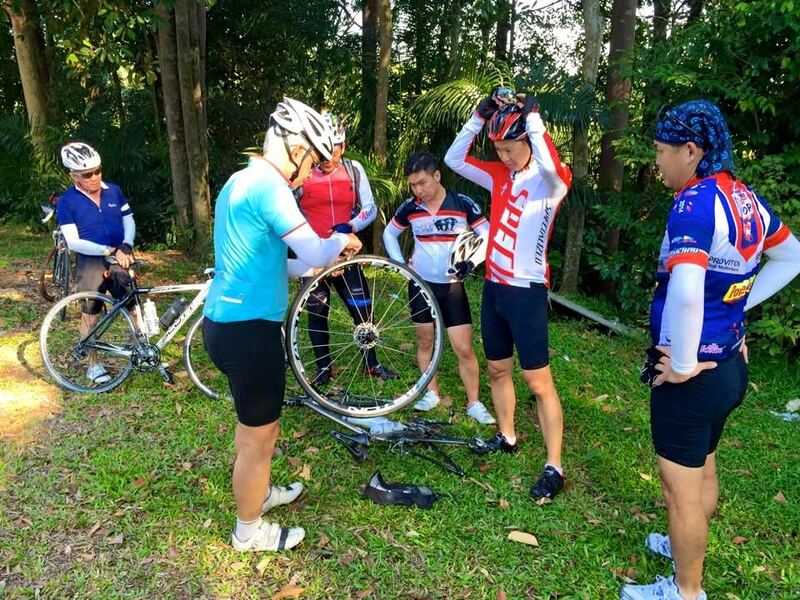 The rest of the ride was uneventful, except for the puncture I had about 10 km from Bukit Jelutong. A piece of wire was the culprit. The edge of a drain at the El Mina R&R stop was a convenient place to perch as I replaced the inner tube. Marco and I rode about 130 km. Certainly more than planned. It is a route worth doing again though. Posted in Cycling in Malaysia and tagged Guthrie Corridor Expressway, Ijog, Kampung Kuantan, Kundang, LATAR Expressway. Bookmark the permalink. My regular Saturday riding buddies had other things to do yesterday morning. So I rolled out of the D’Bayu car park in Bukit Jelutong on my own just as it was getting light. 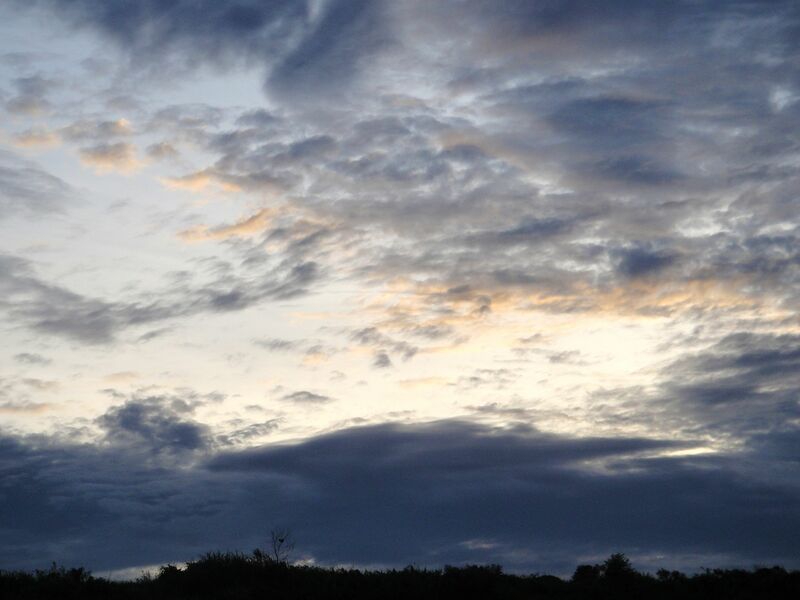 There wasn’t a lot of color in the sky as the sun came up, despite all the clouds. I got to the motorcycle lane alongside the Guthrie Corridor Expressway before 7am. Not surprisingly the motorcycle lane was very quiet. Riding alone always gives me the opportunity to notice things that I miss while on group rides. While I was the only cyclist on the motorcycle lane that early in the morning, this ride is a popular one. The lane is well surfaced and relatively wide. Most of the tunnels under the on and off ramps are well-lit, although there are a couple that provide an unnecessary moment of concern as you pass from bright sunlight into darkness. Especially if the tunnel comes immediately after a sharp turn. 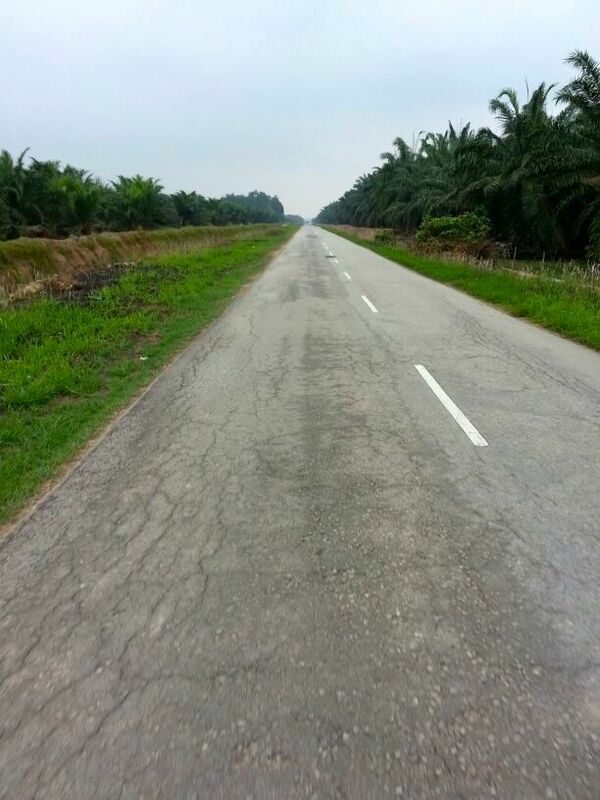 I took the slightly longer route to Kampung Sri Kundang. 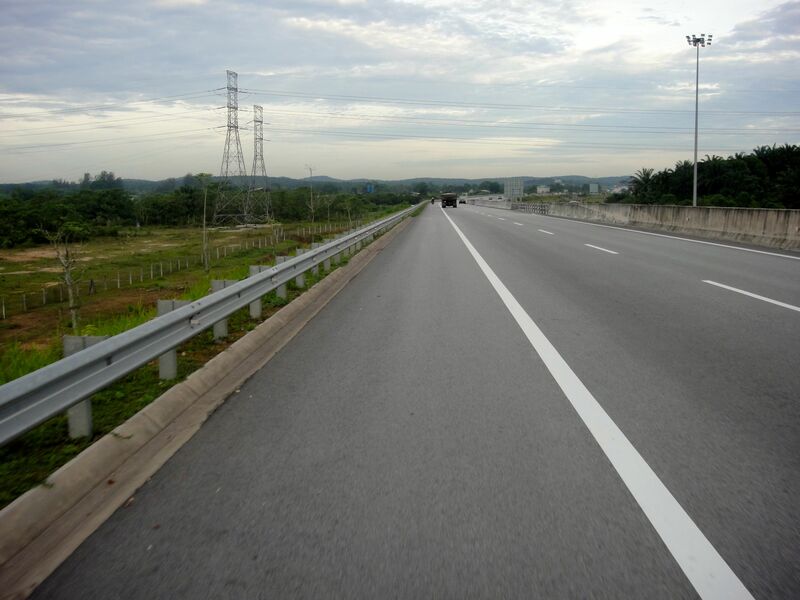 Instead of taking the Jalan Kuala Selangor exit I rode further down the Guthrie Corridor Expressway to the KL – Kuala Selangor Highway interchange. 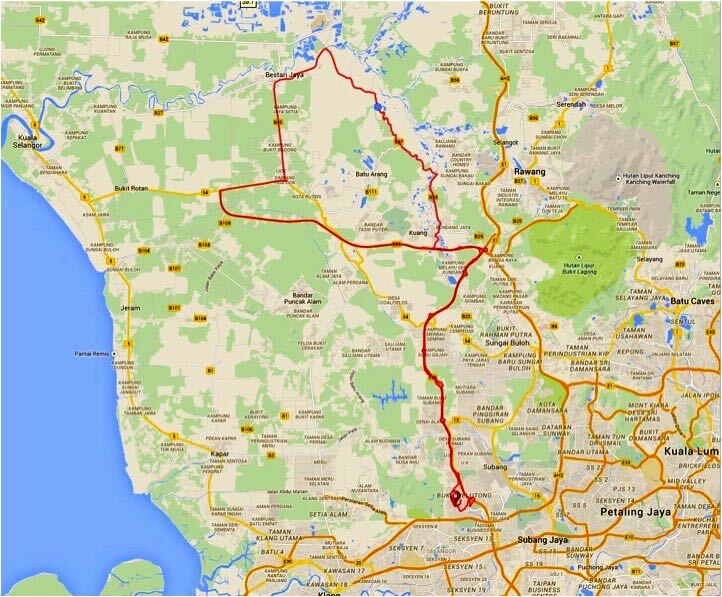 This option means riding about 3 km / 2 mi along the KL – Kuala Selangor Expressway. That expressway, also known as the LATAR Expressway, does not have a motorcycle lane, but the road shoulder is wide enough to accommodate cyclists. I left the highway at Kundang Lakes Golf Club. From there it is a short 3 km / 2 mi to Sharif Roti Canai. Breakfast there is the reason for riding this route. 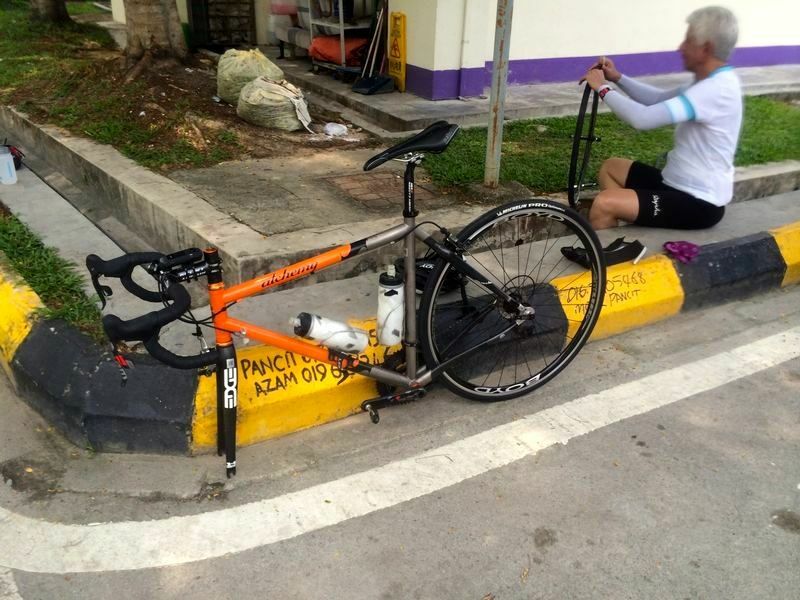 Posted in Cycling in Malaysia and tagged Guthrie Corridor Expressway, LATAR Expressway, Sharif Roti Canai. Bookmark the permalink.